Welcome to our Strengths and Wellbeing chronicles, documenting and sharing our journey as a strengths-based college. SMCC is committed to supporting our students, staff and faculty in the development of their strengths and the enhancement of their wellbeing. Research shows that this focus brings higher levels of engagement, greater wellbeing, and more success to both students and employees. We began our strengths journey during the fall of 2011 with the support of our new president, Dr. Shari Olson. During the first year of our journey, we focused on helping our faculty and staff discover their strengths. Since that time, we’ve held nearly 20 Strengths Educator seminars and more than 250 employees have completed these sessions. In addition, more than 175 faculty and staff deepened their understanding by participating in the Mentoring and Advising program. Through the process of discovering what they do best, our faculty and staff became better prepared to support students in discovering what they do best. The second part of our journey began during the fall of 2012, when our “Strengths for Students” initiative began. During the fall semester, all students new to the college were enrolled in a strengths-based College Success course where they had the opportunity to discover their strengths, and learn how to develop and apply them in order to achieve their academic and personal goals. Each semester since then, hundreds of students have benefitted from this experience, and the evidence clearly suggests that these students are more likely to stay in college, thereby positioning them to succeed and reach their goals. complete the course (33.2%). 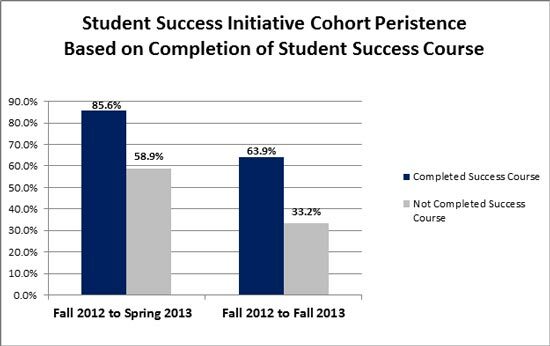 These finding are very encouraging and we will continue to track the impact of our strengths-based College Success course on our new students. In addition to the College Success course, strengths were also integrated into a number of academic courses by our committed and innovative faculty. Faculty teaching in areas such as English, Math, Reading, Education, and Computer Information Systems provided students with the opportunity to discover and apply their strengths through their coursework. Many students in these courses reported that learning about their strengths increased their self-confidence and helped them achieve their goals both in the classroom and beyond. SMCC students also have the opportunity to learn about their strengths outside of the classroom through workshops in Career Services or in workshops held for clubs, teams or programs. Over the past two years, strengths workshops have been held for student groups including Student Government, TRIO, Athletic teams, and for students in our Bilingual Nursing Fellowship Program. As we begin the 2015 academic year, our goal continues to be that everyone at SMCC – students, faculty, and staff – will have the opportunity to learn about their strengths and be given the opportunity to use them every day. As part of the onboarding process, all new employees will continue to participate in the 8-hour strengths Educator session. In addition, regular Brown Bag luncheons will be held so that all employees can deepen their understanding of their own strengths, and their appreciation for the strengths of their colleagues. In addition, we will continue to expand our Strengths for Students program through new initiatives such as strengths workshops, coaching, and strengths-based advising. Finally, we will continue to assess the impact of our strengths for students initiatives through both qualitative and quantitative research. By doing so, we believe we will confirm what the research predicts: Strengths development leads to hope and engagement that, which in turn, leads to wellbeing and academic success. We are proud of the progress we’ve made in our strengths journey, and excited about all that is ahead.